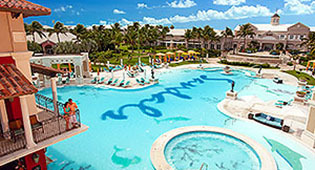 Unfolding like a grand estate, Sandals Emerald Bay is a 500-acre resort set along a 1-mile stretch of white-sand beach on Emerald Bay, Great Exuma, Bahamas. This resort offers a selection of 183 magnificently appointed, luxurious accommodations with styles that range from beachfront villas to charming bay house settings. Unique to Sandals Emerald Bay is a stunning 18-hole Greg Norman-designed championship golf course, reputed to be among the best in the Caribbean, as well as a 17-acre, standalone Emerald Bay Marina by Sandals, the first-ever marina for any Sandals Resort.